PARK WEST BANK AND TRUST COMPANY vs. MARTIN SHER and HARRY SHER as they are Trustees of Bankers Mutual Trust. This is an action brought pursuant to G.L. c.240, §§6-10 to quiet title to land in Harwich, Massachusetts. The plaintiff, Park West Bank and Trust Company (Park West) [Note 1] seeks to quiet title to real property shown on the Appendix [Note 2] as the disputed parcel. The defendants, Martin Sher and Harry Sher, Trustees of Bankers Mutual Trust, filed an answer claiming that they hold title to a parcel of land (the Sher parcel) which includes the disputed parcel and which is shown on a plan of land prepared for Martin Sher by Atlantic Design Engineers, Inc. (the Atlantic plan), which plan is an exhibit in this case. [Note 3] The defendants also requested a declaration that they are the owners of the Sher parcel. On the Appendix, the Sher parcel is shown as consisting of the disputed parcel and the undisputed parcel. Three days of trial were held at which a stenographer was appointed to record and transcribe the testimony. Six witnesses testified, one chalk was used and thirty-nine exhibits, some with multiple parts, were introduced into evidence and are incorporated herein for the purposes of any appeal. Beginning at the northeasterly corner of the premises at stake and stones at the junction of four old roads, southeasterly of John B. Lee's homestead lot, thence southerly in the easterly line of an old road to a stake and stones marked C. A. C. at woodland of Allen S. Joseph's heirs; thence south 61 54' west by land of said heirs and heirs of Joshua Crowell 22 rods 18 links to stake and stones; thence south 18 57' east by land of Fanny H. Walker 25 rods 15 links to stake and stones at land of the heirs of Ephraim Taylor; thence south 87 38' west by said heirs 19 rods 19 links to stake and stones at land of the heirs of Joshua Nickerson; thence north 14 west by said heirs 43 rods 11 links to stake and stones by land of Nathan Walker; thence North 73 6' east by said Walker 15 rods 14 links to stake and stones; thence north 17 30' west by Walker 10 rods 13 links to stake and stones at land of Thomas Freeman; thence North 76 21' east by said Freeman 18 rods 3 links to stake and stones; thence north 70 3' east by an old road and land of the heirs of Allen S. Joseph and Orrin S. Mecarta 37 rods 3 links to the first mentioned bound. Containing 9 acres 19 rods more or less. Henry Thayer, an attorney and title expert who testified for the plaintiff, testified that this description was extraordinarily precise for a deed of that time in Barnstable County. Thayer also testified that when converted from rods and links to feet and inches, the distances stated in the deed corresponded closely to the distances between the monuments found on the ground and shown on the Reilly plan. The only bound for which no distance is stated in the deed is the first bound. In addition, Thayer found the bearings on the plan varied uniformly from those in the deed by approximately thirteen degrees. Thayer opined that this was because magnetic north wanders over the years. 2. Cyrus Cahoon took title to Parcels One and Two under a deed from Jedidah Howes dated September 27, 1866 and recorded at Book 91, Page 144. Howes was the daughter of Samuel Ryder. The first parcel in this deed (which is Parcel One on the Appendix) is described as being bounded on the east by woodland formerly of Ensign Nickerson. No deed into Cyrus Cahoon for the disputed parcel was introduced into evidence. The first deed in the plaintiff's chain of title which appears to include the disputed parcel is the 1896 Cahoon deed. 3. Clement A. Cahoon died intestate on May 24, 1914 and Parcel 12 passed to his heirs. 4. By instrument of taking dated September 11, 1943 and recorded at Book 606, Page 89, the Town of Harwich took Parcel 12 from the heirs of Clement A. Cahoon for the non-payment of real estate taxes. 5. By treasurer's deed dated October 22, 1945 and recorded at Book 636, Page 246, the Town of Harwich conveyed Parcel 12 to Paul G. F. Valkenier. The notice of final disposition of Valkenier's petition to establish his title to Parcel 12 is dated August 23, 1971 and recorded at Book 1525, Page 339. 6. Valkenier conveyed Parcel 12 to Philip G. Sbraccia, Jr. by deed dated March 23, 1973 and recorded at Book 1827, page 43. The description of Parcel 12 in this deed is the same as in the 1896 Cahoon deed. 7. Sbraccia conveyed Parcel 12 to Jean E. Manoog by deed dated March 23, 1973 and recorded at Book 1827, Page 44. This deed contained the same description of Parcel 12 as the deed to Sbraccia. 8. By instrument dated January 6, 1978 and recorded at Book 2645, Page 264, Jean E. Manoog gave a mortgage to Home Federal Savings and Loan Association of Worcester. The mortgage was secured by "any and all land, and interests therein" Manoog owned in Barnstable County, which land included Parcel 12. 9. Manoog defaulted on this mortgage, Home Federal foreclosed on the mortgage and purchased Parcel 12 (along with the other land which Manoog had mortgaged) at the foreclosure sale. The foreclosure deed is dated December 4, 1981 and recorded at Book 3407, Page 343. 10. Home Federal conveyed Parcel 12 to Martin T. Reilly by deed dated October 12, 1984 and recorded at Book 4525, Page 193. The description for Parcel 12 is in all material respects the same as in prior deeds. By the same deed, Home Federal conveyed a second parcel of land to Reilly which abuts the disputed parcel to the north and will be referred to hereinafter as the Morgan parcel (see Appendix). 11. Reilly conveyed both Parcel 12 and the Morgan parcel to C.C.B., Inc. by deed dated January 2, 1986 and recorded at Book 4873, Page 251. 12. By deed dated December 15, 1986 and recorded at Book 5458, Page 132, C.C.B., Inc. conveyed to Donald Szczebak Lots 4-16 shown on the Appendix. These lots encompassed Parcel 12 plus those portions of Lots 4 and 16 which were not included in the disputed parcel. 13. By deed dated September 20, 1989 and recorded at Book 6889, Page 157, Szczebak conveyed Lots 4-16 to the Chicopee Co-Operative Bank. The plaintiff acquired these lots when it merged with the Chicopee Co-Operative Bank. Beginning at the South East corner of the premises at a ditch in Isaac Bea's range, thence Westerly in Isaac's range as the trees are marked to a stake and stones in Samuel Ryder's range, thence Northerly in Samuel Ryder's range as the trees are marked to a stake and stones in the range of the heirs of Stephen Nickerson, thence Easterly in sd (sic) range to a stump and stones, thence Southerly in the range of Joseph Young as the trees are marked to the first mentioned bound, containing four acres and a half more or less. Ryder and Young took title to this parcel as tenants in common, with Ryder taking a two thirds interest and Young one third. The defendants contend that this parcel consists of the disputed and undisputed parcels. 15. Stephen Richmond, a title examiner, testified for the defendants that he did extensive, although not exhaustive, research into the titles of the abutters to the Sher parcel. For the Morgan parcel to the north of the disputed parcel, he testified about a number of deeds in the chain of title although these deeds were not put into evidence. The earliest deed Richmond discussed was a 1891 deed for the Morgan parcel recorded at Book 352, Page 321 from Cyrus Cahoon to Orrin S. Mecarta. The description in this deed runs the southerly boundary of the Morgan parcel by woodland formerly belonging to Samuel Ryder and the northerly line of an old road. Richmond also testified about a deed recorded at Book 346, Page 352 from the heirs of Orrin Mecarta to Wilbur Bassett and a deed recorded at Book 359, Page 339 from Wilbur Bassett to Josephine Morgan, both of which give the same southerly boundary as the deed to Mecarta. Richmond testified that later deeds in the chain of title to the Morgan parcel give the southerly abutter as Ephraim Smith. Richardson also researched the chain of title for land to the east of the Sher parcel. The only deed he testified about which abutted the Sher parcel to the east was a deed dated May 17, 1875 and recorded at Book 140, Page 59 from the heirs of Reuben Young to James S. Paine. 16. The surveyor who prepared the Atlantic plan did not testify at the trial because he was too ill to do so. Instead, another surveyor, Arne Henry Ojala, testified for the defendants. In preparation for his testimony, Ojala reviewed the information which Atlantic Design Engineers had prepared and spoke with the surveyor who had prepared the Atlantic plan. In addition, Ojala reviewed the deeds for the Sher parcel and plans showing the Sher parcel. Ojala did his own survey of the area and prepared a plan, which is entitled "Working Plan and 'Chalk' of Land in Harwich, Mass., Showing Survey of Bankers Mutual Trust Property Prepared for Martin Sher, Trustee" and dated July 29, 1991 (the Ojala plan). The Ojala plan shows Parcels One and Two, the Sher parcel and abutting parcels and also sets out the chains of title to the Sher parcel and the parcels abutting the Sher parcel. When Ojala surveyed the area, he found a ditch which was located twenty feet southerly of a concrete bound which is shown as being the southeast corner of the Sher parcel on the Atlantic plan. 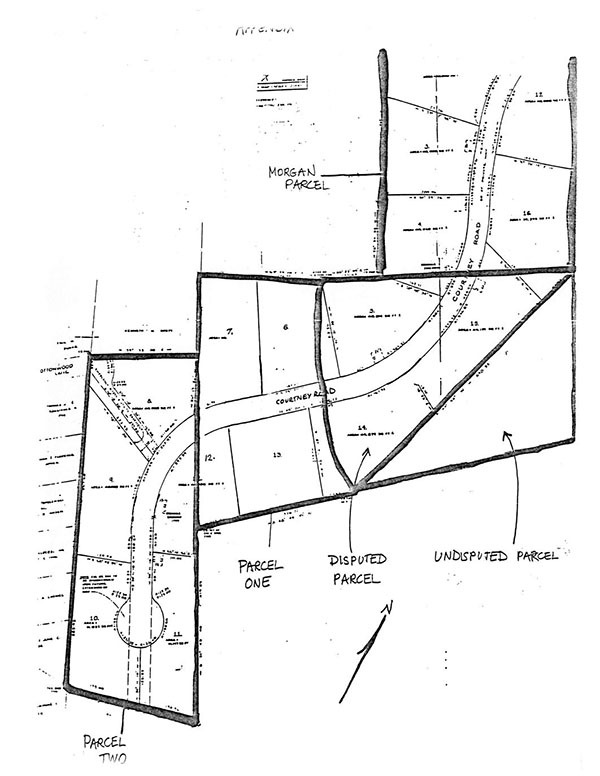 This ditch was not shown on the Atlantic plan nor on an earlier plan	prepared for the defendants by Doyle Engineering Associates, Inc. and dated September 10, 1986. However, based on Ojala's testimony, I find that there is a ditch located as shown on the Ojala plan approximately twenty feet southerly of the concrete bound shown as the southeasterly corner of the Sher parcel on the Atlantic plan. When performing his survey, Ojala did not find any marked trees along the boundaries of the Sher parcel, nor did he find stakes and stones or a stump and stones, as called for in the 1848 deed from Nickerson, at the southwesterly, northwesterly and northeasterly corners. Instead, at these corners, Ojala found concrete bounds encircled by stones which appeared to have been in place for quite some time. 17. Land Court plans 26902A, 26902G and 26902H were introduced into evidence by the defendants for parcels of land to the east of the Morgan parcel and the Sher parcel. These plans show Norman Hammond et al. as the westerly abutter in the approximate location of the disputed parcel and do not show any of the plaintiff's predecessors in title in the general location of the disputed parcel. 18. By deed dated February 27, 1855 and recorded at Book 59, Page 88, Ryder conveyed his two thirds interest in the Sher parcel to Luther Hammond. 19. Edmund Young died on March 31, 1872 and under his will, his one third interest in the Sher parcel passed to his grandsons, Edmund Hammond and Luther E. Hammond (son of the aforementioned Luther Hammond). Therefore, as of 1872, Edmund Hammond and Luther E. Hammond each had a one sixth interest in the Sher parcel. 20. Edmund Hammond's one sixth interest in the Sher parcel passed to his two children and through them, to his grandchildren Reuben Dill, Althea Harding and Edmund F. Harding. By deed dated December 12, 1974 and recorded at book 2306, Page 71, Edmund Harding conveyed his one twenty-fourth interest to Chatham Rhodes, Inc. (Chatham). Edmund Harding as the conservator of the property of Reuben Dill also conveyed Dill's one twelfth interest to Chatham by deed dated June 5, 1975 and recorded at book 2306, page 73. Similarly, Harold Stahler as the conservator of the property of Althea Harding conveyed her one twenty-fourth interest to Chatham by deed dated September 23, 1975 and recorded at Book 2306, Page 62. In each of these deeds, the Sher parcel is described as being bounded northeasterly by land now or formerly of Nellie H. Blanchard, southeasterly by land now or formerly of the heirs of Angeline Andrade, southwesterly by land of owners unknown by old vehicle tracks and northwesterly by land now or formerly of Josephine L. Morgan and by land now or formerly of Mary A. Larkin. 21. Luther E. Hammond died on July 22, 1937 and under his will, his one sixth interest in the Sher parcel passed to his wife, Hannah I. L. J. Hammond (Hannah). Hannah died on July 4, 1943. In her will, Hannah devised one quarter of her real estate to each of three of her children, Mertis J. Hammond (Mertis), Isaac L. Hammond (Isaac) and Hannah Avis Norris (Hannah Avis). The fourth quarter of her real estate was devised to Isaac, in trust, with the income derived from the trust to be paid to her fourth child, Harvey E. Hammond (Harvey). Upon Hannah's death, Mertis, Isaac and Hannah Avis each had a one twenty-fourth interest in the Sher parcel and the remaining one twenty-fourth interest was in trust for Harvey. 22. The one twenty-fourth interests of Mertis and Isaac ultimately passed to their children and/or spouses, who then conveyed their interests to Chatham. Carleton E. Hammond, Mertis' son, conveyed his interest in the Sher parcel to Chatham by deed dated December 14, 1974 and recorded at Book 2306, Page 69. Jeanne H. Cassis, Mertis' daughter, conveyed her interest to Chatham by deed dated December 14, 1974 and recorded at Book 2306, page 67. Myrtle May Hammond, Isaac's widow, Rita May Hammond, Isaac's daughter, and Norman L. Hammond, Isaac's son, conveyed their interest to Chatham by deed dated December 26, 1974 and recorded at Book 2306, Page 63. In each of these deeds, the description of the Sher parcel is the same as in the deeds from the grandchildren of Edmund Hammond. By deed dated December 12, 1974 and recorded at Book 2306, Page 65, Sally A. Norris, Hannah Avis' daughter, Bradford E. Norris, Hannah Avis' son, and Ruth C. Norris, Bradford's wife, purported to convey their interest to Chatham. However, because no probate of Hannah Avis was introduced into evidence, I am unable to determine to whom her interest passed and therefore cannot determine who has title to Hannah Avis' one twenty-fourth interest in the Sher parcel. 23. In each of the deeds from the grandchildren of Hannah Hammond, the grantors state that their interest in the property conveyed was inherited from their respective parents as well as from Harvey Hammond. Hannah's will provided that the trust for Harvey was to terminate upon the deaths of Harvey and his wife, Maude. Harvey died either on November 20, 1952 or November 20, 1953. [Note 5] There is nothing in the record which indicates when Maude died. Accordingly, it cannot be determined from the record when the trust terminated. Therefore, I am unable to determine who presently holds title to the one twenty-fourth interest in the Sher parcel which was in trust for Harvey and I therefore make no finding as to the holder of that interest. 24. Returning to the two thirds interest in the Sher parcel which Ryder conveyed to Luther Hammond, Luther Hammond died on July 22, 1876. No probate of Luther Hammond's estate was introduced into evidence so I cannot determine to whom that interest passed upon his death and accordingly, I can make no finding as to who presently has title to the two thirds interest in the Sher parcel which Ryder had conveyed to Luther Hammond. 25. As of 1975, Chatham held title to the one sixth interest of the Sher parcel which had devolved from Edmund Hammond, as well as a one twelfth interest from the grandchildren of Hannah Hammond for a total interest in the Sher parcel of one quarter. 26. By deed dated March 2, 1976 and recorded at Book 2306, Page 75, Chatham conveyed its interest in the Sher parcel to Anna M. Kelly using the same description of the property as the deeds into Chatham. 27. Arthur G. Newton and Donald Newton gave to Anna Kelly a deed dated March 1, 1976 and recorded at Book 2306, Page 74 which purported to convey the Sher parcel using the same description as in the deeds from the heirs of Edmund Hammond and Luther E. Hammond. In this deed, the grantors state "[f]or our title see deed recorded in Barnstable County Registry of deeds in Book 103, Page 280 and Suffolk County Probate of Adin Gerould Newton." Neither the deed recorded at Book 103, Page 280 (hereinafter document 103/280) nor the probate of Adin Gerould Newton	was introduced into evidence, making it difficult to determine what interest, if any, the Newtons had in the Ryder parcel to convey to Kelly. The only indication from the evidence as to what document 103/280 is, is a notation on the Ojala plan. On the Ojala plan, there is a reference in the chain of title for the Sher parcel to document 103/280 which lists as the grantor of the document "Appraisal of R[eal] E[state] of Luther Hammond, Debtor" and lists as the grantee Ephraim Smith. This suggests that Luther Hammond's interest in the Sher parcel may have gone to Ephraim Smith in payment of a debt he owed Smith. However, since the document itself is not in evidence, it is impossible to determine if that is the case. Furthermore, nothing in the record other than the reference in the deed from the Newtons to Kelly to document 103/280 gives any indication how, if at all, any interest Ephraim Smith had in the Sher parcel was acquired by Adin Gerould Newton. Therefore, because of the uncertainties as to whether Ephraim Smith acquired Luther Hammond's two thirds interest in the Sher parcel, and if he did, how and if Adin Gerould Newton later acquired this interest, I make no finding as to what, if any, interest in the Sher parcel the Newtons conveyed to Kelly. 28. By instrument dated March 2, 1976, Kelly gave to one of the defendants, Harry Sher as trustee of Bankers Mutual Trust, a mortgage secured by the Sher parcel. Kelly defaulted on the mortgage, the said defendant foreclosed and both defendants purchased Kelly's interest at the foreclosure sale. The foreclosure deed is dated May 21, 1981 and recorded at Book 3299, Page 133. In an action to quiet title under G.L. c.240, §§6-10, the plaintiff has the burden of establishing its title to the property in question. Sheriff's Meadow Foundation, Inc., v. Bay-Courte Edgartown, Inc. 401 Mass. 267 , 269 (1987). The plaintiff must prove not only better title to the locus that the defendant possesses, but also sufficient title to succeed in the action. Id. at 269. The first issue to be decided in this case is whether the 1896 Cahoon deed conveyed title to the Parcels One and Two and the disputed parcel to Clement A. Cahoon as the plaintiff contends or whether that deed only conveyed title to Parcels One and Two, as the defendants maintain. The plaintiff rests its claim of title to the Parcels One and Two and the disputed parcel on the degree of precision found in the definition of the parcel in the Cahoon deed as well as the fact that the surveyor who prepared the Reilly plan located on the ground most of the relevant monuments given in the Cahoon deed. The defendants, on the other hand, contend that the parcel conveyed in the 1848 deed from Nickerson to Ryder and Young included the disputed parcel and that therefore, even if the 1896 Cahoon deed does accurately describe a parcel of land which includes the disputed parcel, their title (the defendants') predates the 1896 deed and the heirs of Cyrus Cahoon therefore had no title to the disputed parcel to convey to Clement A. Cahoon. Thayer testified that the description of Parcel 12 in the Cahoon deed was, with the exception of the first bound, extraordinarily precise for a deed in Barnstable County in 1896. The distances between monuments in the deed when converted from rods and links to feet and inches were very close to the distances found on the ground and the bearings are in line with those in the Cahoon deed, except that they varied uniformly by approximately thirteen degrees. The only bound which lacks precision is the first bound which begins at the junction of four old roads and runs southerly along the easterly line of an old road. No distance is given for this bound, but when located as the plaintiff claims it to be (the southeasterly boundary of the disputed parcel), the other distances stated in the description for Parcel 12 fall into place. However, no amount of precision in a deed will operate to convey land a grantor does not have title to. The only deed into Cyrus Cahoon which was introduced into evidence was a deed for Parcels One and Two. No deed into Cahoon for the disputed parcel was introduced. The lack of a deed for the disputed parcel introduces an element of doubt as to the plaintiff's title to the disputed parcel, particularly where there is a deed into Cyrus Cahoon for Parcels One and Two. Further doubt as to the plaintiff's title to the disputed parcel is cast by certain deeds for the Morgan parcel to the north of the disputed parcel. The 1891 deed from Cyrus Cahoon to Orrin Mecarta for the Morgan parcel gives as the southerly boundary land of Samuel Ryder. If Cyrus Cahoon had title to the disputed parcel which was south of the parcel he was conveying to Mecarta, it seems reasonable to assume that he would have used his land as a southerly boundary. The deeds for the Morgan parcel from the heirs of Mecarta to William Bassett and from William Bassett to Josephine Morgan similarly describe the southerly boundary as formerly of Ryder. Later deeds in the chain of title to the Morgan parcel refer to Ephraim Smith to the south (who the defendants claim to be in their chain of title). No evidence was introduced to show that in any of the deeds to the Morgan parcel, the southerly boundary was given as being the land of any of the plaintiff's predecessors in title. In addition, the 1866 deed from Jedidah Howes to Cyrus Cahoon describes Parcel One as being bounded on the east by land formerly of Ensign Nickerson, which would be consistent with the location of the Sher parcel claimed by the defendants. Finally, Land Court plans 26902A, 26902G and 26902H which show land bounding the Morgan parcel and the Sher parcel on the east, show Norman Hammond et al. as the westerly abutter in the approximate location of the disputed parcel and do not show any of the plaintiff's predecessors in title in that approximate location, further weakening the plaintiff's claim of title to the disputed parcel. These factors, when viewed together, create such doubt as to the plaintiff' title to the disputed parcel that I rule that the plaintiff has not sustained its burden and established that it has title to the disputed parcel. The next issue to be determined is whether the defendants have established their title the disputed parcel. This requires a careful examination of the 1848 deed. The description in the 1848 deed begins at the southeast corner of the premises at a ditch in Isaac Bea's range. Ojala, the defendants' surveyor, surveyed the area and prepared a plan. Ojala testified that when he surveyed the area he found a ditch which was located twenty feet southerly of the southeast corner of the Sher parcel shown on the Atlantic Plan. I have found that this ditch exists in this location, which is consistent with the defendants' claimed point of beginning of the description of the Sher parcel in the 1848 deed to Ryder and Young. Ojala did not find any marked trees or stakes and stones as called for in the 1848 deed from Nickerson. From the ditch, the description then runs westerly in Isaac Bea's range as the trees are marked to a stake and stones in Samuel Ryder's range. The southerly boundary of the Sher parcel could be located as the defendants claim it to be because Isaac Bea at one time owned that land along the southerly boundaries of Parcel One and the Sher parcel. This lends support to the defendants' claim of title. However, the defendants did not present sufficient evidence to enable the court to ascertain the location of the other abutters referred to in the 1848 deed. If the Sher parcel is located as the defendants claim, the land abutting the Sher parcel to the west would be Parcel One. The westerly abutter in the 1848 deed is given as Samuel Ryder. The defendants introduced the probate of Samuel Ryder which showed that Jedidah Howes was the daughter of Samuel Ryder. Although it is possible, and maybe even likely, that Samuel Ryder owned Parcel One before his daughter, the defendants introduced no evidence to prove this. Therefore, no evidence which was introduced established that Ryder ever owned Parcel One and that the land of Ryder to the west of the parcel conveyed in the 1848 deed was Parcel One. The northerly abutter of the Sher parcel is given in the 1848 deed as the heirs of Stephen Nickerson. Although Richardson, the defendants' title examiner, testified that he did the chain of title to the Morgan parcel north of the disputed parcel in its entirety, he made no mention of the heirs of Stephen Nickerson being in the chain of title to the Morgan parcel, casting doubt on the defendants' claimed location of the Sher parcel. Finally, the easterly abutters of the Sher parcel are given in the 1848 deed as the heirs of Joseph Young. Richardson also testified that he did extensive work on the title of the land abutting the Sher parcel on the	east. However, in his testimony, Richardson made no reference to having found the heirs of Joseph Young in that chain of title. The only deed which he testified about for the parcel abutting the Sher parcel to the east was an 1875 from the heirs of Reuben Young. This casts further doubt on the defendants' claim that the Sher parcel is indeed located where they claim it to be. Based on the foregoing, I rule that the defendants have not sustained their burden of establishing that the Sher parcel described in the 1848 deed is located where they claim. Furthermore, even if the Sher parcel is located on the ground where the defendants claim it to be and does include the disputed parcel, I have already found that the defendants have only established that they have a one quarter interest in the Sher parcel. Therefore, I rule that the defendants have not established that they have title to the disputed parcel. The defendants have successfully refuted the plaintiff's claim of title to the disputed parcel but have failed to prove their own. [Note 1] The original plaintiff in this action was Donald Szczebak who on September 20, 1989 transferred property which included the disputed parcel to the Chicopee Co-Operative Bank. Subsequent to the transfer, Chicopee Co-Operative Bank merged with Park West Bank and Trust Company and Park West acquired all of Chicopee's assets. Accordingly, Park West was substituted as the plaintiff on May 15, 1990. [Note 2] The Appendix is a copy of part of a plan of land entitled "Subdivision Plan of Land in Harwich, Mass. Prepared for Martin Reilly" prepared by Nickerson and Berger, Inc. and dated July 31, 1985 (the Reilly plan) and upon which certain notations have been made by the Court. [Note 3] The copy of this plan which was put into evidence was unsigned and undated. [Note 4] All deeds referred to hereinafter are recorded at the Barnstable County Registry of Deeds unless specified otherwise. [Note 5] Two certificates of death for Harvey E. Hammond were introduced into evidence, one dated 1952 and one dated 1953, so I am unable to determine which was the actual year of Harvey's death.